The latest post on Steve Cerra’s Jazz Profiles blog is about S. Duncan Reid’s biography of Cal Tjader (1925-1982). 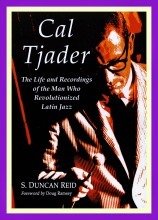 The subtitle of Reid’s book identifies Tjader as “The Man Who Revolutionized Latin Jazz.” There may be those who assert that Dizzy Gillespie, Machito and Tito Puente should get at least equal credit as revolutionaries in the field, but there is no question that Tjader’s pioneering attracted huge attention to Latin idioms. He was as successful in mainstream as in Latin jazz. Among the major sidemen he attracted were Eugene Wright, Clare Fischer, Vince Guaraldi Al McKibbon, Paul Horn, Willie Bobo, Mongo Santamaria and the brilliant young bassist Freddie Schreiber. In the course of his career, he managed to gain the respect of his peers in Latin music, sell large numbers of records, and fill clubs, concert halls and jazz festivals. Without being a spoiler, Cerra summarizes the book by quoting from it and from Tjader admirers including Hank Jones, Scott Hamilton and critic Ted Gioia. 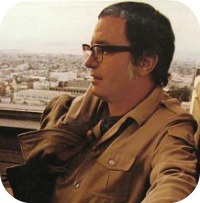 He incorporates two well-chosen videos of Tjader in performance. I don’t wish to be a spoiler either, so here’s Tjader in a different video, as a guest with Gillespie. Whoever posted this on YouTube gave no information about when and where the performance was taped, but I am reasonably certain that the voice at the end is that of Jimmy Lyons, the impresario of the Monterey Jazz Festival. He mentions flutist Roger Glenn, and Mickey Roker on drums. The guitarist looks like Al Gafa, the electric bassist like Earl May. That indicates the early 1970s. I am unable to identify the conga drummer and the miscellaneous percussionist. Perhaps you can. Full disclosure: I wrote the foreword to the Duncan Reid book, and I approve this plug. In the late 50’s I lived in Mill Valley, CA. There were many people driving sport cars. I had a Triumph from England that was always in the shop. I was driving from my home onto Highway 101 near the Tiburon wye, and my TR stopped running. I needed to get into San Francisco for a gig. I was standing near the 101, and a car stopped and offered me a lift. At that time it wasn’t scarey to get a ride, so I hopped in. It was a sports car (an MG), I believe, and driving it was Cal. I told him where I was going and he dropped me off. Not one word did he say while we were driving, but I knew him because he used to play his music at my High School in San Anselmo. What a kick! I worked with Miss Norris in NYC and at a club in the Bahamas during the mid 1960’s. She is a fine singer with an unusual sound and trust that she still works at clubs in California and around San Francisco. There was a fantastic trumpet player living and playing in the Bahamas and during our breaks he gave me a tour of the Island. Wish I could remember his name. Maybe Bobbie remembers? There was a serious hurricane during the Bahamas gig and left us stranded for a week in our rooms, before the gig got back on its feet, or hands(! ), so to speak. I believe she is now married to a fine pianist so that leaves me out! Boo Hoo!! Ms. Norris is married to and performs with pianist Larry Dunlap. Gillespie, Dizzy (trumpet); Glenn, Roger (flute); Gafa, Al (guitar); Howell, Michael (guitar); May, Earl (bass); Tjader, Cal (vibraphone); Daddy, S. Kwaku (percussion); Peralta, Luis (percussion); Roker, Mickey (drums).